ElectroLyrics is a browser plugin which you could install onto your web browsers from electrolyrics.co. The program is promoted as a product which enables lyrics on the right of the music video you are viewing on YouTube. This application together with LyricsPlug, LyricsKid, Betslyrics and tens of other well-known browser add-ons belongs to the Lyrics faction, and all of them should be deleted from web browsers. As our researchers have discovered, the suspicious advertisement supported program is usually followed by advertisements which will flood your browsers. Needless to say, if you do not want to face an avalanche of suspicious advertisements, you need to remove ElectroLyrics. If you have downloaded the plugin from its official website, you should have no issues having it deleted from the system. Needless to say, if you have trusted a third party distributor to acquire the program there is a chance that the removal of the application will be aggravated by other undesirable software. Some third party software distributors bundle authentic, reliable programs, and others act on the command of cyber criminals and package seemingly legitimate software with malware. If you install automatic spyware detection and removal software to safeguard the operating system you will not need to worry about any potentially unwanted or dangerous programs slipping in. Are you happy with ElectroLyrics services? Do you enjoy finding lyrics to the songs you listen to on YouTube? Even though you may find this quite beneficial, you need to be extra cautious with the ads which may show up. Have you already discovered advertisements flooding your browsers and you do not know what to do? First of all, you should reconsider clicking on these ads or trusting the promoted services. 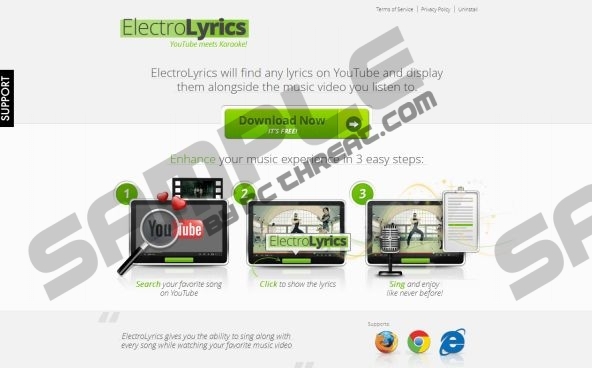 If there are no security tools installed on the computer any click could lead to exposing your own virtual security, which is the main reason why ElectroLyrics removal should be performed. To delete ElectroLyrics from the computer you can proceed in several different ways. We recommend using automatic malware detection and removal software, especially if you suspect other suspicious applications installed on the PC as well. You can also proceed manually; however, in this case you should still entrust reliable tools to inspect your system. SpyHunter offers a free-of-charge scanner which will examine the system, and you can install it by clicking on the download button below. Select the one program you wish to remove and click Remove. Move to Uninstall a program to locate installed software. Right-click the program you want to remove and then click Uninstall. Quick & tested solution for ElectroLyrics removal.